Parker S. Hoffman, age 19 of York, NE died Saturday, March 16, 2019 at York. Parker and his brother Peyton were born with Pelizaeus-Merzbacher Disease and have many PMD brothers across the country. He was born August 6, 1999 at Aurora, NE to Chad S. and Julie A. (Matzner) Hoffman. He was a 2018 graduate of York High school and was an avid sports fan, following the Nebraska Cornhuskers, the Kansas City Chiefs and the Chicago Cubs. He even had a hand painted mural of Wrigley Field on his bedroom wall, complete with two players representing him and his brother, Peyton. 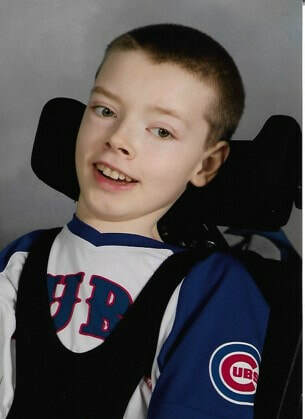 Parker enjoyed watching Disney and action movies, Reality TV shows such as ‘Survivor’ and ‘Gold Rush’. He enjoyed a good “knock- knock” joke, he had several devices that he could tell you one as well. Freeze dance and playing ‘pretend picnics’ with his niece and nephew was always fun. His favorite part was clinking cups together and saying “Cheers” as they did it, brought a huge smile to Parker’s face! He loved his weekends at the families get away at a local sandpit. Boating and fishing were his favorite things to do. He always seemed to catch the first fish. And a good water balloon fight would bring huge smiles to his face. His dogs Wrigley and Peanut were special to him and going for long walks around the Sandpit was a fun activity. He enjoyed Animal Science classes in school with his special bunny ‘PB’ sitting on his lap. His favorite animal was elephants and loved watching programs about them. Parker enjoyed helping his dad plant beans in the family garden, and helping with construction projects around the house, just last week helping his dad and getting to shoot the nail gun. Parker was extremely smart, quirky, determined, stubborn, and full of humor. Parker experienced many physical ailments over the last few years and he faced each battle with the strength of a WARRIOR! He taught everyone who knew him what it takes to be strong, fearless, and absolutely courageous! He is now FREE of his earthly disabilities and reunited with his big brother. As many can imagine, they probably haven’t stop talking, challenging each other to races, or planning a fishing trip to cast a line. He is survived by his parents Chad and Julie Hoffman of York, sister Paige (Derek) McKenzie of York and their children Harper Peyton, Hudson Parker and expected baby, and his dogs Wrigley and Peanut. He is also survived by grandparents Robert (Vernalene) Hoffman of Bradshaw, NE, and Peggy Matzner of Columbus, NE, great grandmother Arlene Eklund of Bradshaw, aunts and uncles: Brandee (Christian) Nice of Bradshaw, Erik (Rita) Hoffman of New Orleans, LA, Jim (Kathy) Matzner of McCool Jct, NE, Janet Matzner of Gresham, NE and Jean Anne Matzner of York, and many cousins. His dearest friends: Tenly Hansen, Brianna Cobb, Colby Andersen, and Colton Bell. He was preceded in death by his brother Peyton, Grandfather Donald Matzner, Uncle Jerry Matzner, and Aunt JoAnne Matzner. Funeral services are scheduled for 2:00 p.m., Wednesday, March 20, 2019 at the First United Methodist Church in York with the Reverend Art Phillips officiating. Burial will follow in Greenwood Cemetery, York. Visitation will be from 9:00 a.m. -8:00 p.m. on Tuesday with his family greeting friends from 6-7:30 p.m., later that evening at the mortuary. Memorials may be directed to his family for later designation.